The Flodge, as it is called around our neck o’the hood, is a reliable favourite when a pub meal is required. Which is surprisingly often. I only wish it was a bit closer to home. 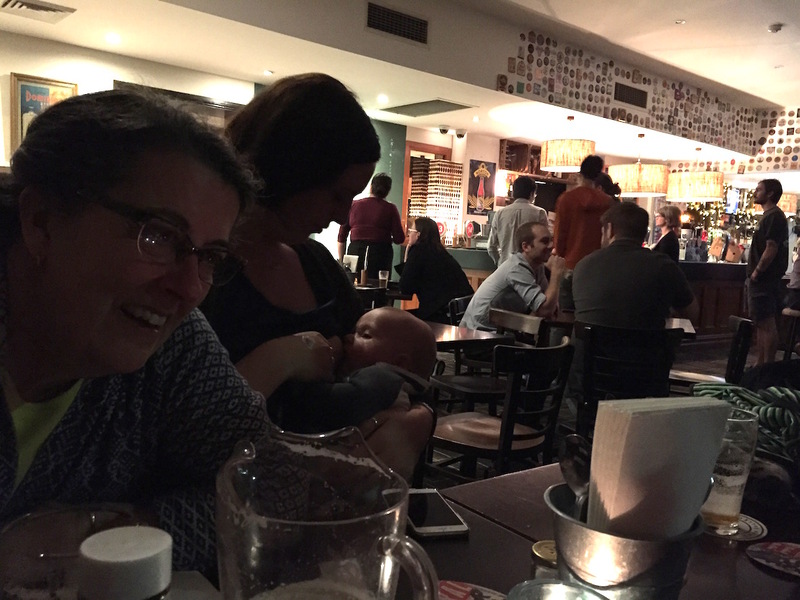 Our latest outing to the Flodge was on the last night of our new grandson’s inaugural tour of Sydney. It was a very family affair with the Stropolina, the Stropette, the Heathen, and Pancetta, together with the great uncles (gruncles) Jim and Matt, and of course the guest of honour, the Mosster. For logistical reasons some of us walked to the pub and some of us drove. Strop, the Stropolina and I set off at a brisk clip along Parramatta Road, pushing the Mosster in his carriage, only to be overtaken and tooted at repeatedly by the hoons with the Victorian rego plates. Bloody Mexicans. On the upside, by the time we get there, a table has been occupied and beers have been purchased. The Flodge offers a bewildering range of Beers With Spectacularly Silly Names (BWSSN), which usually gives me a headache, but luckily the Heathen has it sorted. It may be called Feral Hop Dog but this BWSSN is acceptably sessionable so I won’t have to think about what to drink next. I’ll just have another of those feral thingies. Or maybe a jug full. The Flodge is not a huge pub but it is busy. This is partly because it is close to Sydney University, but it is more than just the location. It has a comfortable homey feel. This doesn’t mean that it is one of those pubs furnished like a group house from the seventies with crusty mismatched sofas and dead televisions stacked in the corner. It is something to do with the scale of the spaces and the atmosphere. It is friendly, equally welcoming to families and student clubs, many of whom seem to hold their parties or meetings in the back room. It has a good and very reliable kitchen which serves up high quality pub grub, along with enough specials to keep things interesting. Even if they do always seem to sell out just before I get to the counter to order. Our large table takes a long time getting its collective act together to decide on what we’re eating. This is mainly because of conversation. There is a lot of it going on, and quite a bit of competition for the attentions of the children too. The Stropolina has cornered the baby market, and is keeping the Mosster to herself, while gruncle Jim is exercising his child-whispering skills, getting the Pancetta to do him lots of drawings and writing. Eventually someone breaks from the pack and stops procrastinating over the menu. In response, the rest of us firm up our decisions, change our minds, then switch back again at the last minute. Eventually everyone’s choices are locked in. 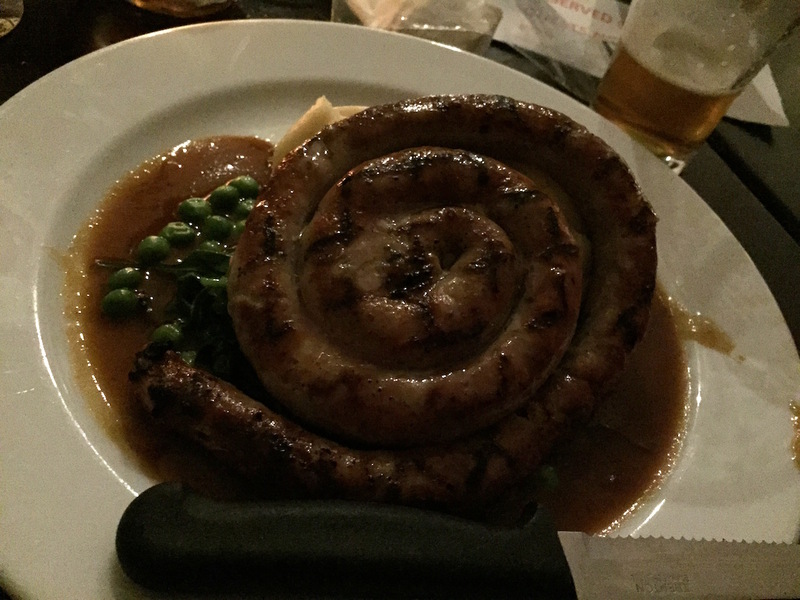 The curly sausage and mash are a hot ticket item, while the nursing mother opts for a red-blooded steak. The Heathen surprises everyone with a last minute change to a chicken pocket, and Strop goes the fish curry. Pancetta settles for fish and chips from the kids menu. There, that wasn’t so hard was it. While we are waiting for the food, more Hop Dog is obtained and the musical members of the family start singing Kookaburra Sits In an Old Gum Tree in rounds. The Pancetta takes a break from looking at photos of herself as a baby on someone’s phone, long enough to look bemused at this musical interruption to the pub sound system’s hipster-nostalgia soundtrack, made up of hits from Creedence, The Animals, Canned Heat, and Steppenwolf. The singing causes a frisson of panic in the enlarged brains of the students, causing them to look over their shoulder’s nervously, before leaning their heads closer together and resuming their earnest discussions of what the hell Ryan Adams is doing messing with Taylor Swift’s oeuvre. I had the sausage. It was long and curly and tasted great. The Stropette is a bit of a connoisseur of the condiments, and even she was impressed by the range on offer at the Flodge. A particular standout was the bbq sauce. 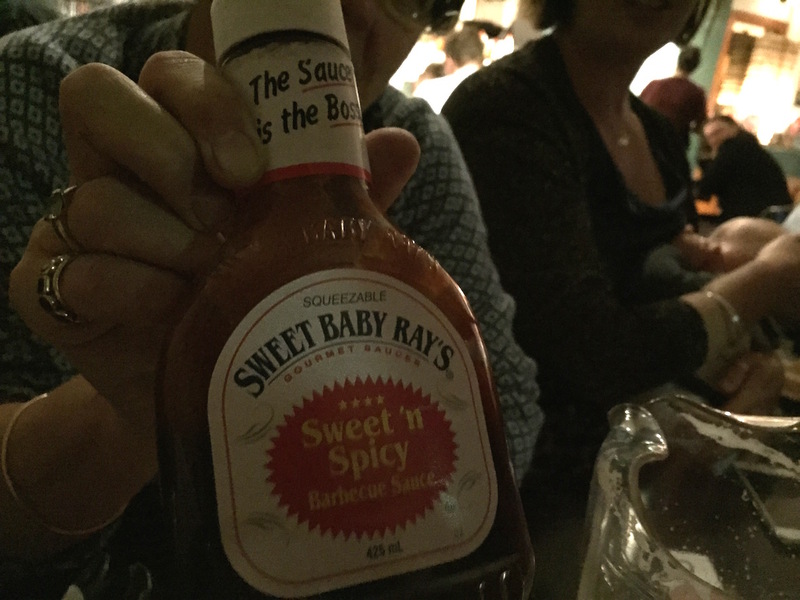 It may come in a plastic squeezy bottle but Sweet Baby Ray’s Sweet ’n Spicy is the business. You can taste the good-ol’-boy smokiness in every squeeze. The Pancetta’s meal was notable because even though it came from the kid’s menu it looked like regular food. No nuggets, fish fingers, or other processed junk here. It was battered fish, proper chips AND a salad. Children are little people – they deserve people food. As a reward for hoeing into her fish and chips, Pancetta was allowed to order ice cream for dessert. On hearing this news she gave a very cute little fist pump. Yes! The rest of us couldn’t make up our minds – twice in one night was asking a bit much – so we ordered one of everything to share. We might not be able to make a decision but FOMO rules okay? 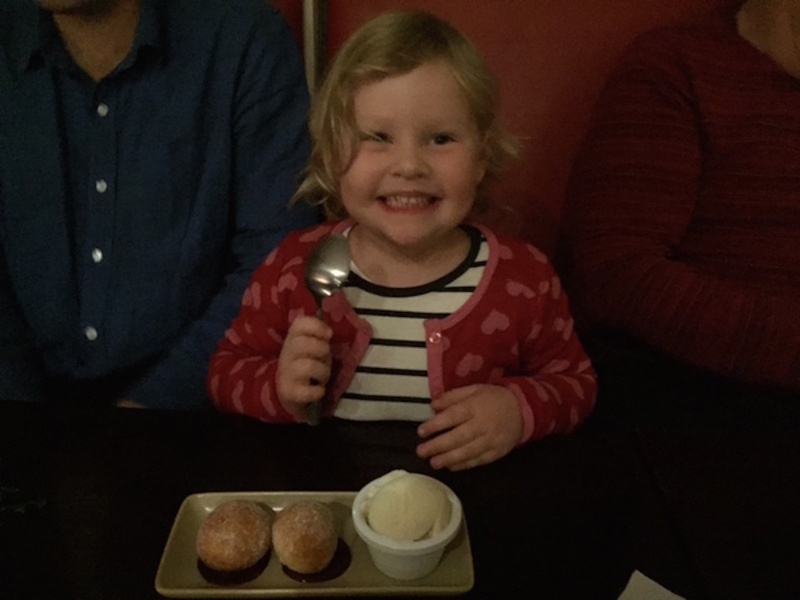 Pancetta greeted the arrival of her ice cream with a very smug smile, but then gruncle Matt wrapped her up in one of his conversational spells, complete with illustrations in the form of holiday photos of French castles on his phone. Pancetta of course wanted to know where the princesses were, which led to a long and involved discussion on the fate of princesses in post-revolutionary France, and a lot more photos of castles and chateau. While Led Zeppelin kicked in with a Stairway to Heaven soundtrack, the rest of us were in awe, watching the ice cream slowly melt as the Two Great Conversationalists went at it. 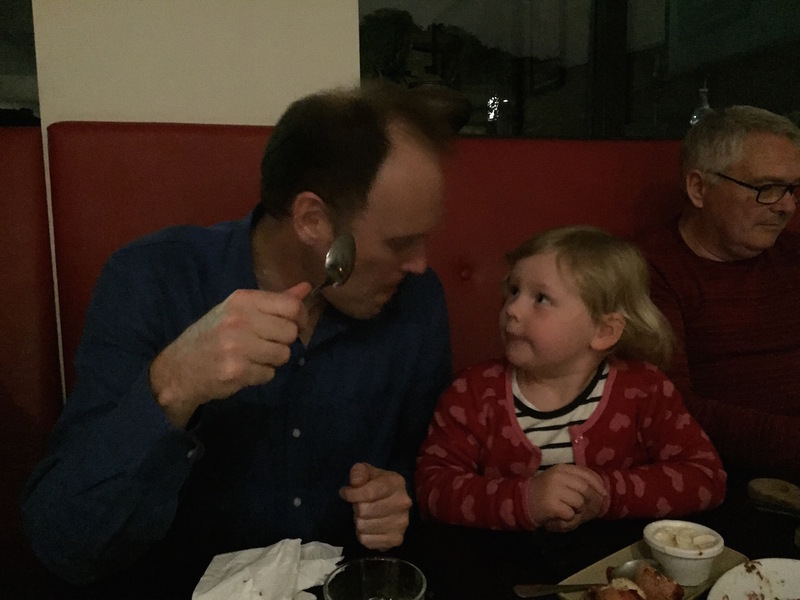 The Stropette was a bit less charmed than the rest of us, speculating that it was just a very sophisticated ruse by her daughter to increase her daily quota of screen time. Pancetta didn’t come out of her revery until the rest of us were getting up to leave. Suddenly the spell was broken and she remembered the ice cream. No!!! Not yet, I haven’t finished. Forest Lodge Hotel. Put it on your list.